Check out our range of fun cow facts for kids. Learn the world population of cattle, what young cows are called, what they eat and much more. Read on and enjoy a variety of interesting information about cattle. 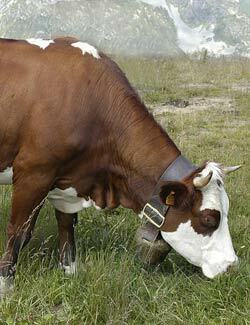 Cattle are herbivores that eat vegetation such as grass. There are well over 1 billion cattle in the world. Cattle are sacred in India. There are an estimated 300 million cattle in India. Young cattle are generally known as calves. Adult females are generally called cows. Adult males that are not castrated are generally called bulls. Cattle are red/green color blind. In the sometimes controversial sport of bull fighting, bulls are angered by the movement of the cape rather than its red color. Cattle are farmed for a number of agricultural products including meat and dairy products. Meat from adult cattle is known as beef. Meat from calves is known as veal. Cattle trained to be draft animals are known as oxen (ox).